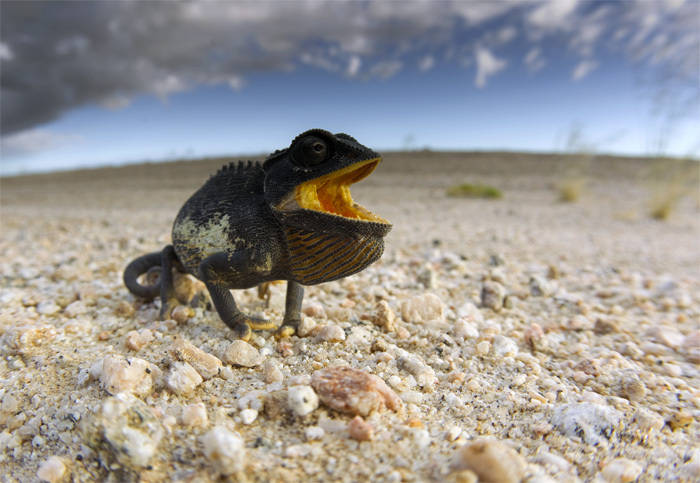 An angry Namaqua chameleon on the road. As soon as we approached the animal and tried to pick it up, the beautiful brown went away and the chameleon turned black in an instant, puffing up and hissing at us! An approaching dust cloud in the distance told us there was another vehicle on the road and we had to trouble the already annoyed little chameleon a little more for its own sake. Somehow Wendy managed to pick it up while I distracted it and off the road it went just in time before a speeding bus went screaming past us. And now it was time for a quick photo session to document my first chameleon “rescue” of sorts. A few photographs later, I realized that I was only making the chameleon angry and decided to stop. It wasn’t the friendliest encounters one can have with a chameleon. That was in 2011. I had to wait until early this year before I could see my next Namaqua chameleon. Wendy and I were on a desert tour when we first saw one by the roadside in the Dorob National Park. It was early in the morning and the sun had just started penetrated the blanket of fog that is so common along the Namibian coastline. A chameleon had climbed up on a small bush and was absolutely black in color, like our angry chameleon in 2011. I wondered what was causing it to be so angry, when I was told that chameleons also turn black to absorb sunlight in the mornings just so that they can get their day started after a cold and torpid night. And since chameleons’ color changes are involuntary and instinctual, you just have to wonder what smart instincts they have! Later during the day we came across another Namaqua chameleon just beside the road. This one was light purple and brown and seemed rather content with itself. The sun had warmed it up, but what was interesting was that as soon as we stopped the chameleon started walking toward us in ernest. It didn’t take long to figure out the reason, as the tour leader held out a dead desert beetle in his hand. Apparently, this chameleon was a local star that participates in chameleon education sessions! It was amazing to see how the eyes of the chameleon calculate the striking distance. The tongue comes out slowly at first and strikes in a fraction of a second. 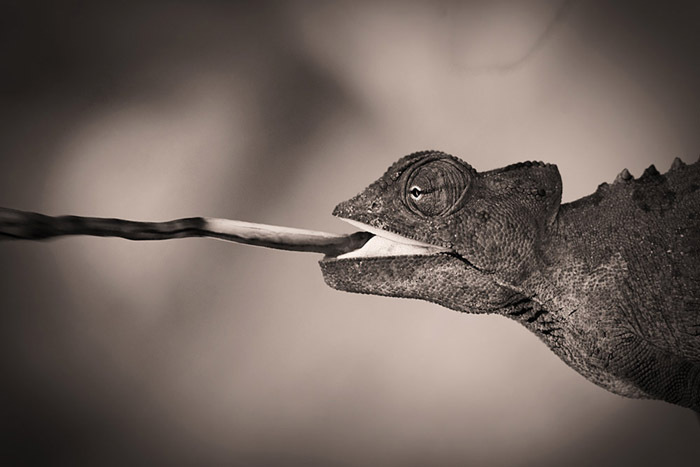 This chameleon was habituated enough to be close to people and not feel threatened. While I usually don’t like to photograph habituated animals, I made an exception with because of my bad experience two years ago. 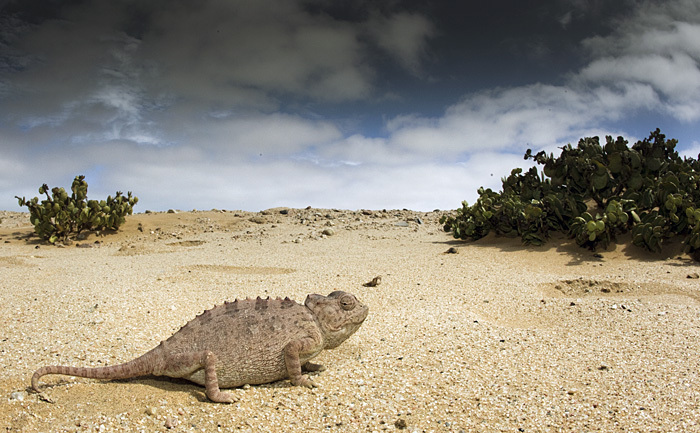 Perhaps the next time I meet a Namaqua chameleon, it will not be on such extreme terms. Only time will tell. 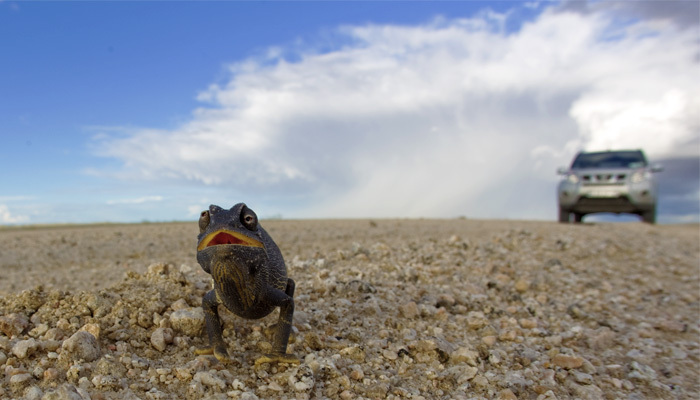 The threatening display of a Namaqua chameleon.